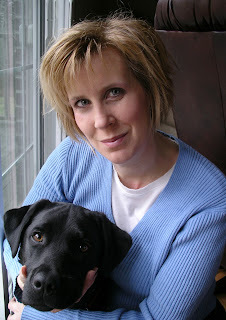 Author Thea Atkinson has over one million different titles available. Okay, I exaggerate . But she is prolific and every encounter I have with her is fun and insightful. She has a number of shorts and full-length novels available and she's writing new material all the time. I feel a certain kinship with Thea as she tends to write really character-driven pieces that each look at some of the darker corners in a room. Let's peek into her world and see how she maintains such a furious writing pace and what she's up to. You would know nothing of mine. Ha. So there. I’d love to say I wrote all the Amanda Hocking stuff or the Harry Potter stuff, but unfortunately, I write weirder stuff than that. Somebody dies. Every time. Well, maybe not the last novel. I think they all lived, but it was close. Seriously, I write what would be termed psychological fiction. Anomaly is my latest, One Insular Tahiti was my first Kindle offering and then Secret Language of Crows. 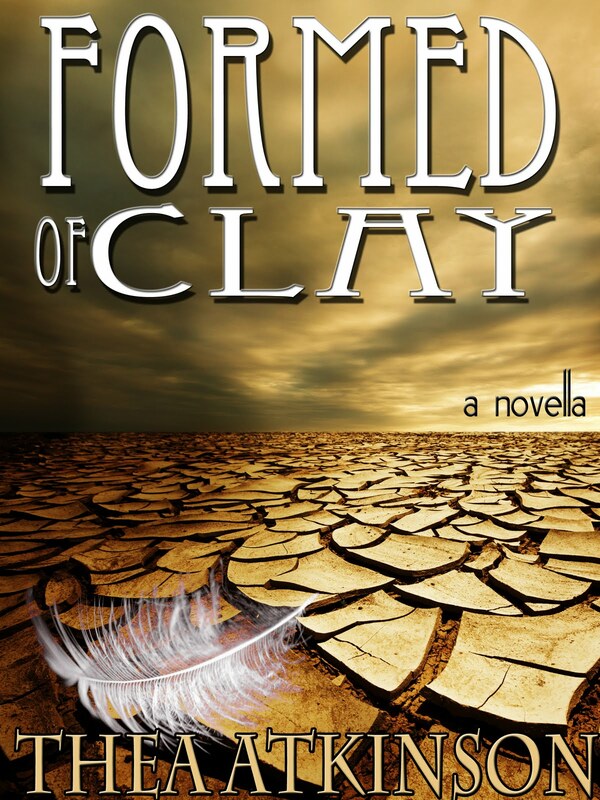 All drama, character driven fiction. On the dark side in places…enough to make some readers cringe, but in the end, I hear they root for the characters, so it can’t be all bad. My laptop is in my kitchen but it is guarded by two 4 inch gargoyles. I have space for tea. I’m always drinking tea when I write. It’s better libations than booze, truth betold. It lubricates my psyche. I listen to Tool and A Perfect Circle and Black Crowes and Dave Mathews band and Fiona Apple and….well, you get the picture. I listen to music a lot while I write. It lubricates the typing fingers. I’m usually wrapped in my polar fleece housecoat—even when I’m fully dressed. I like to be warm, you see and it’s pretty cold in NS in the winter. It might be ‘Spring’ now according to the calendar, but someone forgot to tell the North wind. My black lab is inevitably lying at my feet. Sometimes groaning because she wants attention, sometimes groaning because she wants fed. Most of the time, she’s snoring: another reason for the music. I am working on the next in my series…well the first in the series. I’ve just released the prequel and the first book is well underway. It’s different than my usual because I’m hoping to have some paranormal in it—more of a slipstream sort of affair. And it’s different because it’s my first series. I usually tell stories in one fell swoop and then move on. I think I have enough story with this one to make a series of four books. I figure the first book will be out in September. You know, barring a meteorite, or in NS, the equivalent, which is a snowstorm in July. Oiy. So tough. Hmmm. My approach is that of discovery. I want to write what I want to read. So I sully forth trying to tell myself a story—one that I really want to hear. I always fall short, but really, that’s what propels me. I want to know about the characters and what motivates them…what brings them to the ends they end at, and what will they do once they get there. It took my husband a long time to realize that me lying on the couch with a pillow and a blanket did not mean I was sleeping. I was ‘plotting’. It’s the best way to plot. I like to meditate with a pillow and a blankie. And with my eyes closed. So shoot me. He is always supportive. Very much so and he is my worst critic. If I pass something by him, it has to pass muster. Sometimes it doesn’t and I have to start again. 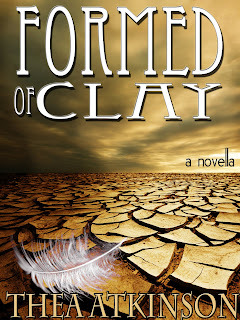 I’m at http://theaatkinson.wordpress.com and I’d love to send folks to my novella: Formed of Clay on Amazon. Just 99cents you know. Not a bad bargain for a nobody like me. Thank you so much for stopping in and sharing this view into your world and work with us, Ms. Atkinson! Nice to learn more about Thea. I had a good laugh reading "...lying on the couch with a pillow and a blanket did not mean I was sleeping." This is so true! Meditation is a wonderful way to prepare the mind to write, and I do it too, less so to create plots in my head, but to "clear the deck," so to speak. Oh ... and Thea, you are NOT a "nobody." Once you've made it to The Farthest Reaches, you are definitely on your way! THanks for visiting and reading and responding, Eden. I really enjoyed writing this little bit of info for The Farthest Reaches as it's such a great blog in the first place. As for meditating. YES! It clears all the poop off the poop deck! Excellent interview, Thea - revealing, humorous, and informative. Much success to you with your new series. Looking forward to it! Mark and Eden, thanks for reading and leaving your comments. You're both right: Thea has a wonderful presence and it's to all our benefit that she could stop in at the Reaches and discuss her writing -- and in such a fun way. Thanks again, Thea! Good stuff, indeed. Which begs the question why *I* haven't graced your watery page, Oh Great Jason??? Speaking of this, I better ask now or I'll get yelled at: Susan, would you like to be featured on "Behind the Words"? Hey, Sandra, thanks for stopping in. So cool that you're such a big Thea fan! Aw. you make me blush! Love this piece! Thea, I am all for meditating with a pillow and blankie. I do it, as well, and have worked out many plot issues and scenes along the way. I also do it while sitting in the sun, watching my dogs play. Doing nothing rarely means we're truly doing nothing! Darcia: thanks so much for your kind words; it's good to find a kindred meditating spirit. Meditation. I do it too, Darcia and Thea. Mine usually involves a hot cup of tea and some good music. These days, I get little of either but I try. Glad to hear you both have similar needs and outlets. And, Darcia, you're always welcome to drop by. Calling me brilliant is optional but, of course, it's preferred. It was so much fun getting to know the one and only 'Theapatra' in this interview! My favorite revelation? "It took my husband a long time to realize [buy into the notion] that me lying on the couch with a pillow and a blanket did not mean I was sleeping. I was ‘plotting’." The mental picture this produces complete with an arm-crossed, head shaking husband was amusing to imagine, but I know the approach works--and apparently it works REALLY WELL for you, Thea! Thanks for sharing intriguing details about the writer side of Thea! Great post! Haha! Ann, your mental picture is the same one I had. As a husband, I can only offer this: often our head-shaking is the honest result of an earnest effort just to understand.